Musings on Markets: Beijing Blunders: Bull in a China Shop! I have generally steered from using my blog as a vehicle for rants, not because I don't have my share of targets, but because I know that while ranting makes me feel better, it almost always creates more costs than benefits. It is true that I have had tantrums (mini-rants) about the practice of adding back stock-based compensation to EBITDA or expensing R&D to get to earnings, but the targets of those tend to be harmless. After all, what can sell-side equity research analysts or accountants collectively do to retaliate? Refuse to send me their buy and sell recommendations? Threaten me with gang-audits? This post is an exception, because the target of the rant is China, a much bigger and more powerful adversary than those in my mini-rants, and it is only fair that I let you know my priors before you read this post. First, I am hopelessly biased against the Chinese government. I believe that its reputation for efficiency and economic stewardship is inflated and that its thirst for power and money is soft-pedaled. Second, I know very little about the Chinese economy or its markets, how they operate and what makes them tick. It it true that some of my ignorance stems from the absence of trustworthy information about the economy but a great deal of it comes from not spending any time on the ground in China. So, if you disagree with this post, you have good reason to dismiss it as the rant born of ignorance and bias. If you agree with it, you should be wary for the same reasons. The Chinese Economic Miracle: Real or Fake? 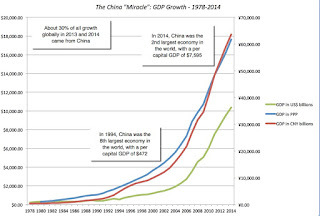 The China growth story is real: Any one who has visited China will tell you that the signs of real growth are around you, especially in urban China. It is not just the physical infrastructure of brand new airports, highways and high-speed trains, but the signs of prosperity among (at least some of) its people. I did my own experiment yesterday that confirmed the reality of Chinese growth. After I woke up to the alarm on my China-made iPhone, I put on my Nike exercise clothes, manufactured in China, slipped on my Asics running shoes, also from China. As I went through the day, it was easier for me to keep track of the things that were not made in China than those that were. Based just on that very unscientific sampling, I am willing to believe that China is the world's manufacturing hub. It has a Beijing puppet-master: To those who celebrate the growth of the Chinese economy as a triumph of free markets, I have to demur. The winners and losers in the Chinese economy are not always its best or most efficient players and investment choices are made by policy makers (or politicians) in Beijing, not by the market. There are those who distrust markets who would view this as good, since markets, at least in their view, are short term, but trusting a group of experts to determine how an economy should evolve can be even more dangerous. It is driven by infrastructure investment, not innovation: The Chinese economy is skilled at copying innovations in other parts of the world, but not particularly imaginative in coming up with its own. It is revealing that the current vision of innovation in China is to have a CEO dress up like Steve Jobs and make an Android phone that looks like the iPhone. Note that this should not be taken as a reflection of the Chinese capacity to be innovative but a direct consequence of centralized policy (see prior point). The China story is now part of every business: In just the last month and a half, I have been in the US, Brazil and India, and can attest to the fact that the China story is now embedded in companies across the globe. In the US, I saw Apple report good earnings and lose $100 billion in market capitalization, with some attributing the drop to disappointing results from China. In Brazil, my Vale valuation rests heavily on how China does in the future, because China accounts for 37% of Vale's revenues and the surge in iron ore prices in the last decade came primarily from Chinese infrastructure investment. In India, I valued Tata Motors, whose acquisition of Jaguar , has made them more of a Chinese company than an Indian one, dependent on the Chinese buying oversized Land Rovers for a significant portion of their profits. It is also a weapon of mass distraction: In a post from a few months ago, I talked about weapons of mass distraction, words that analysts use to induce you to pay premiums for companies and to distract you from specifics. In that post, I highlighted "China" as the ultimate wild card, with mention of exposure to the country operating as an excuse for pushing up the stock price. The problems with wild cards though is that they are unpredictable, and it is entirely possible that the China card may soon become a reason to discount value, as the handwringing about earnings effects and corporate exposures of the China crisis begins. The Chinese Markets: All Pricing, all the time! It is undeniable that markets have been melting down since June, with the Shanghai Composite down 32% from its peak on June 12. However, if you had invested in Chinese stock at the start of this year, you have no reason to complain, with a return of 8.44% for the year to date, among the best-performing markets globally. Stepping even further back, if you had invested in Chinese stocks in 2005, you would have earned close to 13$ as an annual return each year, with all the ups and downs in between. In earlier posts, I have drawn a contrast between valuation and pricing and why a healthy market need both investors (who buy or sell businesses based on their perceptions of the values of these businesses) and traders (who buy and sell assets based on what they think others will pay for them). A market dominated mostly by investors will quickly become illiquid and boring, and ironically reduce the incentives to collect information and value companies. A market dominated by traders will be volatile, with price movements driven by mood, momentum and incremental information, and will be subject to booms and busts. I would characterize the Chinese stock market as a pricing market, where traders rule and investors have long since fled or have been pushed out. While there are some who will attribute this to China being a young financial market, and others to cultural factors, I believe that it is a direct consequence of self-inflicted wounds. Investor restrictions: There is perhaps no more complicated market to trade in than the Chinese markets, with most Chinese companies having multiple classes of shares: Class A shares, and traded primarily on the mainland, denominated in Yuan, Class B shares, denominated in US $, traded on the mainland and Class H shares, traded in Hong Kong, denominated in HK$. The Chinese government imposes tight restrictions on both domestic investors (who can buy and sell class A shares and class B shares, but only if they have legal foreign currency accounts, but cannot trade in class H shares) and foreign investors (who can buy and sell only class B and class H shares). As a consequence of these restrictions, investors are forced into silos, where shares of different classes in the same company can trade at different prices and governments can keep a tight rein on where investors put their money. Note also that the highest profile technology companies in China, like Baidu and Alibaba, create shell entities (variable interest entities or VIEs) and list themselves on the NASDAQ, making them effectively off-limits to domestic investors. Opaque financials and poor corporate governance: While China has moved towards adopting international accounting standards, Chinese companies are not doyens of disclosure, often holding back key information from investors. It is therefore not surprising that almost 10% of all securities class action litigation in the US between 2009 and 2013 was against Chinese companies listed in the US, that variable interest entities hold back key information and that non-Chinese companies like Caterpillar and Lixil have had to write off significant portions of their Chinese investments, as a result of fraud. This non-disclosure problem is twinned with corporate governance concerns at Chinese companies, where shareholders are viewed more as suppliers of capital than as part-owners of the company. Markets as morality plays: The nature of markets is that they go up and down and it is that unpredictability that keeps the balance between investors and traders. In China, the response to up and down markets is asymmetric. Up markets are treated as virtuous and traders who push up stock prices (often based on rumor and greased with leverage) are viewed as "good" investors. Down markets are viewed as an affront to Chinese national interests and not only are there draconian restrictions on bearish investors (restrictions on short selling, trading stops) but investors who sell stock are called traitors, malicious market manipulators or worse. Thus, the same Chinese government that sat on its hands as stock prices surged 60% from January to June has suddenly discovered the dangers of volatility in the last few weeks as markets have given up much of that gain. The bottom line is that the Chinese government neither understands nor trusts markets, but it needs them and wants to control them. By restricting where investors can put their money, treating short sellers as criminals and market drops as calamities, the Chinese government has created a monster, perhaps the first one that does not respond to its dictates. The current attempt to stop the market collapse, including buying with sovereign funds, putting pressure on portfolio managers, name calling and sloganeering may very well succeed in stopping the bleeding, but the damage has been done. The best cure for bias and ignorance is data and I decided that the first step in ridding myself of my China-phobia would be a look at how Chinese stocks are being priced in the market today. The essence of value investing is that at the right price, any company (including a Chinese company with opaque financials and non-existent corporate governance) can be a good investment and it is possible that the drop in stock prices in the last few months has made Chinese stocks attractive enough for the rest of us. I compared China with India, Brazil and Russia, the three other countries that have been lumped together (awkwardly, in my view) as the BRIC, as well as with the rest of the emerging markets. For comparisons, I also looked at the US and the rest of the developed markets (where I included Japan, Western Europe, Australia, Canada and New Zealand). In spite of the drop in stock prices in the last few months, Chinese stocks are collectively more expensive than stocks anywhere else in the world. Chinese companies lag the rest of the world, when it comes to EBITDA and operating margins, but do better than other emerging market companies on net margins. On returns on equity and invested capital, Chinese companies are more profitable than Brazilian companies (reflecting the economic downturn in Brazil in the last year) but are pretty much on par with the rest of the world. One reason for the superior net margins at Chinese companies is that they tend to borrow less than companies elsewhere in the world, perhaps the only bright light in these comparisons. That may be at odds with some of what you may be reading about leverage in China, but it looks like the debt in China is either more in the hands of local governments or is off balance sheet. It is true that this market-level look at China may be missing bargains at the sector level and to remedy that, I looked at PE ratios and EV/EBITDA multiples regionally, by industry grouping. The industry-average values, classified by region, can be downloaded here, but across the ninety five industry groupings, Chinese companies have the highest PE ratios in the world in fifty and the highest EV/EBITDA multiples in fifty eight. You could dig even deeper and look at company-level data and you are welcome to do so, using the complete dataset here. Overall, I am hard pressed to make a case for investing in Chinese stocks, if you have a choice of investing in other markets, even after the market drop of the last few months. If you are a domestic investor in China, your choices are more restricted, and you may very well be forced to stay in this market. It is interesting that India and China, two markets that restrict domestic investors from investing outside the country, are the two most richly priced. As I confessed up front, I am not a China hand and don't claim any macro or market forecasting skills, but my experience with company valuation and pricing lead me to make the following predictions for China. Slower real growth: If I were a betting man, I would be willing to take a wager that the expected real growth rate in the Chinese economy will be closer to 5% a year for the next decade than to the double-digit growth that we have been programmed to expect. That may strike you as pessimistic, after the growth of the last two decades, but just as size eventually catches up with companies, the Chinese economy is getting too big to grow at the rates of yesteryear. The question, for me, is not whether this will happen but how the Chinese government will deal with the lower growth. While the sensible option is to accept reality and plan for lower real growth, I fear that the need to maintain appearances will lead to a cooking of the economic books, in which case we will have an number-fixing scandal of monumental proportions. More pricing ahead: I don't see much hope that investors will be welcomed back into Chinese markets any time soon. So, even if this market shakeup drives some of traders out of the game, investors motivated by value will be reluctant to step in, if the government continues to make markets into morality plays. As long as the market continues to be a pricing game, the price moves in the market will have little do with fundamentals. As a consequence, I would suggest that you ignore almost all attempts by market experts to explain what is happening in Chinese markets with economic stories. Buyer beware: If you are drawn to Chinese markets (like moths to a flame), here is my advice for what it is worth. If you are an investor, you need to look past the hype and value companies, opacity and complexity notwithstanding, and be a realist when it comes to corporate governance. If you are a trader, this is a momentum game and if you can get ahead of momentum shifts, you will make money. If your bet is on the downside, just be ready to be maligned, abused or worse. I understand why corporate chieftains and heads of government are unwilling to speak openly about the Chinese government, given how much of their own economic prosperity rests on maintaining good relations. Financial markets don't have such qualms and they are delivering their message to Beijing clearly and decisively. Let's hope someone is listening! Thanks for the article Aswath, I completely agree with your conclusions. I believe the benefits of a free market economy outweigh the negatives of the occasional "bubble burst" or downturn which a natural part of the stock market life-cycle. If the Chinese got on board with this rationale, it would open their economy to a whole new range of "investors." Also, I agree that they need far better corporate governance - maybe bring in some western models - independent board of directors, no related company transactions, etc. Thanks for the article. If you divided up the universe between international (Nasdaq/HK) and domestic, the difference in valuation would be a lot more pronounced. HK has a market PE multiple at 9x, so it drags down your overall China multiple. Not saying that the HK market is cheap though, as that multiple is dragged down by PRC banks trading at 5x PE (with a E that is more likely than not understated), but that's a completely different topic. Do you think China would be back to investment and export-led growth model compared to the domestic consumerism model it was seeking on attaining? And when you were valuing Vale and Lukoil back in April, did the China effect create some bias in your valuation or did you you assume other countries would pick up the slack when China isn't consuming commodities at its historic rates. The real economy may not be a Potemkin village, but the financial markets are, to some degree. The financial markets are sort of like a 13-year-old 7 foot tall Yao Ming, size of US in the 1980s, maturity of the US markets in the 1890s. For US listings, there's the whole VIE nonsense, which seems technically illegal and what one actually owns seems questionable. Ultimately there are no means for shareholders to exercise control, or ensure that they participate in a firm's success. Shenanigans are common. Financial statements can be inaccurate. Management can loot, with little recourse. A company which is a national champion today can sometimes be in the government's crosshairs tomorrow, e.g. Weibo Vs. WeChat. There is no Western style credit analysis for bank loans or bonds, or value analysis of stocks. It's all just speculation on what the government will pump up next. Banks are funded by financial repression, ie there is no where else for locals to put their savings, and real interest rates are negative. Banks then lend at the government's direction. There is no legit risk capital - you want to start a business, you either get a government or foreign sponsor, or turn to the shadow banking system. And if someone in the state owned sector decides they want to muscle you out, there's a good chance you are out of luck. Caveat emptor ... at some price, a Chinese stock might provide a dividend, some value cushion, and an option on growth, if it happens, the powers that be decides to let you share in it, and perhaps one day markets mature. But I wouldn't bet on it before a massive blowup. "By restricting where investors can put their money, treating short sellers as criminals and market drops as calamities, the Chinese government"
This gets my goat always as it implies that only Chinese government only does it. Every country does it. Did the western world not treat short sellers as criminals in 2008 and whenever markets drop do the governors at the Fed (who incidentally are trying to control the economy in their own way - condescending since highly educated way-- can be called as meddling with unintended consequences) not come out in droves as if market drop is a calamity, change the accounting norms from mark to market to mark to whatever you like. More over this is sold as if it is not done it will be worse, it is for your good etc. Basically fool people and keep them under an illusion. My point is that western world does it too, may be not in the ham-handed manner as the Chinese seem to be doing now. BTW, I am not a fan of the Chinese. That means strip the whole thing of sophistication, everyone does the same thing with the same intention -- extend and pretend, kick the can, make belief, name it what you will. They are all wolf in sheep's clothing -- bent on cheating people, on the assumption they are cretins. They are all Goebbels - sophisticated or otherwise, western or eastern. I relished your insightful article on the Chinese markets. But the point that you have made on India ie. Indian Domestic Investors are restricted from investing outside India is not true. A request from me would be to get your views similar to this blog on how you perceive Indian markets and its projection as the fastest growing market in the world. You are right. It is not just the Chinese government that views markets as morality plays, but no other government controls the levers of commerce, policy and government as much as the Chinese government does. But I will do a broader post on the false divide between good and bad investors. First I'll give Chinese government a lot of credit for the country's growth in the last two decades. The fundamental problem of China's financial market is the quality of investment management cannot catch up with the explosive demand increase due to household wealth growth. While institutional investors dominate the US market, retail investors generate 85% of the trades in China's stock market. The average age of public fund managers are below 30. They couldn't get trusted for the lack of experience and lower integrity. With such a market, it's absolutely true that most investors only knows about "pricing" but not "value". However, if the government doesn't exert excessive control, most retail investors would eventually lose to a small fraction of elite investors. They will never let that happen, particularly if the majority of winners are not from domestic. I don't quite agree that the China government discourages short-selling activity. On the contrary, the government has been gradually opening its market by all means. Many trading strategies and financial products have started to be allowed in the market since last year. Unfortunately, most investors, even professional fund managers, don't have enough expertise. The recent market crash is all because of the misuse of leverage, on both institutional level and retail level. Comparing to western market, China's stock market is a toddler. So it raises a lot of debates about how the government should guide the market. What we experienced in western economy might not be correct or the only way to cure China's problem. Meanwhile, it will take time for China's asset management industry to get matured and trusted. Hi Professor, I also agree on your points as an investor. But, I think this is a highly debatable thing when it comes to China and its interference in the market mechanism. However, the extent of interference may be different in China compared to the US. But, even in the US the Fed has been controlling the interest rates, interefered in the markets when the crash happened. They did not just let the free market to decide it all. For instance, even in the markets there are circuit brakers etc which will stop a sudden crash. (No one is just waiting and seeing until free market decides the outcome! )Look at the incidents of AIG, GE in the aftermath of the GFC. Even in that period, market deregulation has been blamed and the success before that was attributed to the free market. Further, it is also widely known that the playing field is not fair for everyone. For instance, all three entities WB, IMF and WTO have had their ways of interfering in markets and by and large these are controlled by US and the main players. Even when it comes to corporate governance, some of the largest entities like Facebook have not got it right. Further, about different classes of shares, Google has it. I think it is not so different in EU or elsewhere. I think this Free Market thing is the Potemkin Village in that respects. So, if the governements did not intervene those countries will be facing immense hardships. Look at Greece now. (it's a different debate altogether). Hence, as political beings it is very unfair to expect one to be fully open and accept free market without hesitation. (given how the things have evolved). Look at India and what happened to them before and after imperial control. so it is normal for anyone to be skeptical and behave accotdingly. As you mentuoned, therefore (not as political beings) as investors we have to realize these anf behave admitting the realities. I disagree with you on the Fed controlling rates, but even if you believe that governments in other countries try to control markets, Beijing is in a class by itself in exercising absolute control. And what exactly happened in India before and after imperial control? It was a slow-growth, bureaucratic mess before (and you could blame the British) and it was a slow-growth bureaucratic mess after (and you could blame the Fabian socialists who ran the country with their five-year plans and experts who knew it all). I don't think that financial markets were part of either story. Michael, I sympathize with you but don't agree. You seem to be arguing that young portfolio managers and retail investors cannot be trusted in markets, because they are uninformed and greedy. Are you suggesting that institutional investors, in general, and older investors, in particular, are less greedy and more informed? That has not been my experience, but even if I accept your stipulation, I am not sure that a group of 65-year old party faithful in Beijing is any less greedy or any more informed on economic matters. Sir - An unrelated (to China) query....why do people look at EV/EBITDA. Is it not more apt to make the denominator in sync with the numerator and hence use EV/EBIT. Even you have referred to EV/EBITDA in this China rant! Am I missing something? Pl clarify the funda. Thanks Prof. For the insightful post. As the global financial markets getting closer and closer. One crisis could trigger a global panic as it is happening now, so it is essential understand the magnitude and the nature of the Chinese financial meltdown. Another interesting thing. Is how to update the valuation of stock like AAPL, YUM, NVDA etc. since all these companies have big portion of their revenue, margins and profit coming from China? Is the latest valuation of AAPL worth a revision? And how to do it? I have one question about your capitalization of R&D. Hi Professor, China has controlled interest rates but it is now on the path of liberalization. The cheap money - pre 2008 was used to roll out infrastructure - post 2008 its infrastructure spend was inefficient (bridges to nowhere) as it panicked and inadvertently bailed out the global economy. Yes state control is all pervasive but are the markets not discounting it already. Bank stocks implied COE in the DDM model is 13 to 14%. Yes consumer stocks are expensive but seems justified -The wage increases in China of 12 % pa over the last few (another step in the right direction) support the retail sales (still growing in double digits).